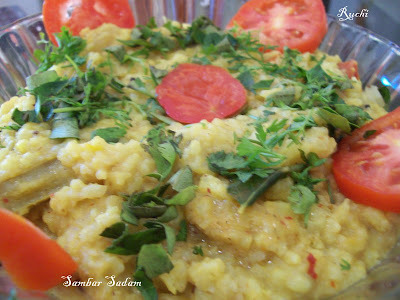 Sambar sadam :Turdal and Vegetables cooked in Rice with Spices, Since it is cooked with lentils, vegetables and rice and it is nutritious along with dal with veggies . It’s a complete meal .. This rice for sure will tickle the taste buds of all sambar lovers. . It’s more like Bisi Bele bath, but without much of those spices .. we won’t need to prepare any vegetable curry with this. This has become a usual menu in my home. I am a great fan of this rice dish. It tastes great when served hot with papadam .Everyone in my home like this rice. It goes well with raitha ,Papadam and chips. I am sure anyone who had tried it would definitely love to have it. Heat a tsp of oil, roast the above ingredients, adding coconut at the end. Roast everything till it becomes slightly brown in colour and dry grind it. Dry roast the spices as mentioned in the ingredients and dry grind it. Heat a tbsp of oil and add the ingredients for seasoning. When mustard splutters, add onions, green chilli and sauté till it they become transparent. Then add all the vegetables and sauté for a few more seconds. Then add cooked dal, cooked rice and 4-5 tsp of ghee and mix well and remove from heat. Garnish with coriander leaves. Serve hot with papadam & Raitha. I am sending this entry to Radika Vasanth & Sudeshan's Food for 7 Stages of Life-Tiffinbox. Bisi Bele Bhath in Kannada, love that rice. Look spicy and yummy. mmm, I am just smacking my lips now!!! Makes me crave for some!!! Some ghee on top it will all be over in mins!!! Samber rice is usually prepared as our sunday lunch in India.We all love the combination you have mentioned.Very nice post. Real comforting food....makes me crave..
Delcious smahar sadam, with papad it willbe yummy. Yummy sambar sadam.. perfect comfort food da! I love sambhar sadam,I planned ot make tomorrow! Love your version! wow... just a delicious entry..... Can smell the spices virtually right in my home.... Thanks a bunch for sending this entry. that's a lip smacking rice, my favorite combination for this rice is nice crispy vathal, tasty one!! !